Eiko & Koma’s River is an evening-length (70-minute) dance performance work set to an originally commissioned score by the noted Japanese composer Sômei Satoh. Composed for string quartet, the score was performed live by the San Francisco-based Kronos Quartet at the BAM Next Wave festival, the Williams Center for the Arts at Lafayette College, at Yerba Buena Center for the Arts in San Francisco, the JACCC in Los Angeles, and in Buenos Aires. 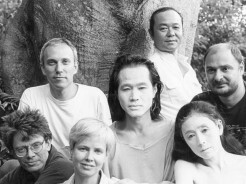 Somei Satoh and the Kronos Quartet received a 1998 Bessie for their collaboration. Performing naked in a visual environment of their own design, Eiko & Koma evoke humanity’s ancient connection to landscape and time. The river is the past. In it, we give birth to our future. River, which extends the investigations begun in their 1995-96 outdoor version of the work, can be considered the third panel, after Land (1991) and Wind (1993), of Eiko & Koma’s environmental triptych.